You are here: Home / News & Events / Foundation / Batter up! Now in its eighth year, the Diamond Classic for Kids, is a charity baseball game that raises money for the school health program at Akron Children’s Hospital. 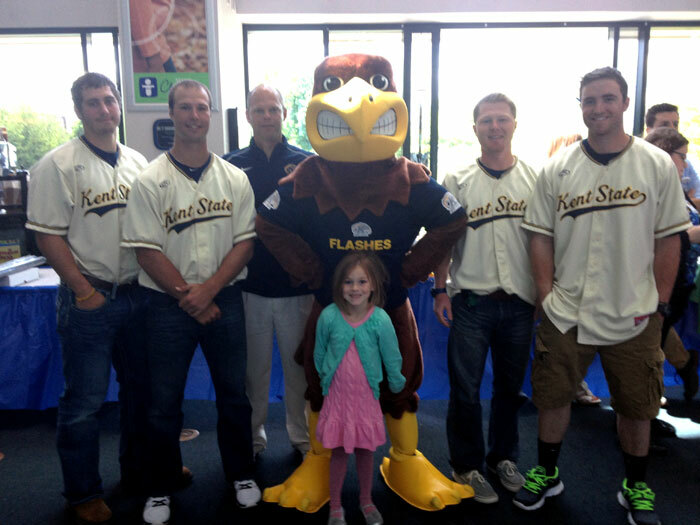 “This hospital fits because we play [the charity game] at Canal Park,” said TJ Sutton, a Kent State baseball player. “And it’s a local hospital,” added Jared Turocy from the University of Akron. On May 13, several players from both teams came to the hospital to spend time with our patients. The baseball players brought rally towels, t-shirts and posters to give the patients and they talked to them about “normal” stuff. The players say they are able to come together for this game to support the hospital and our patients. The 2013 Diamond Classic is May 16 at 6:35 p.m. at Canal Park. “If you come out you get to watch baseball and help out a good cause,” said Turocy. Tickets are $5 for attendees seven and older and can be purchased at the gate or online at http://ach.kintera.org/diamondclassic. Call 330-543-8340 for additional information.